Tony Luetkemeyer and Martin Rucker (right) are running for the Missouri Senate from the 34th District. A mailer sent by the state Republican Party falsely accuses Rucker of being tied to a scandal in the St. Joseph School District. Martin Rucker II is the man running for state senate in the 34th District. His father, Martin Rucker, served one term on the St. Joseph school board. The elder Rucker was on the board during the FBI investigation into the school district, but there was never a hint he did anything illegal. 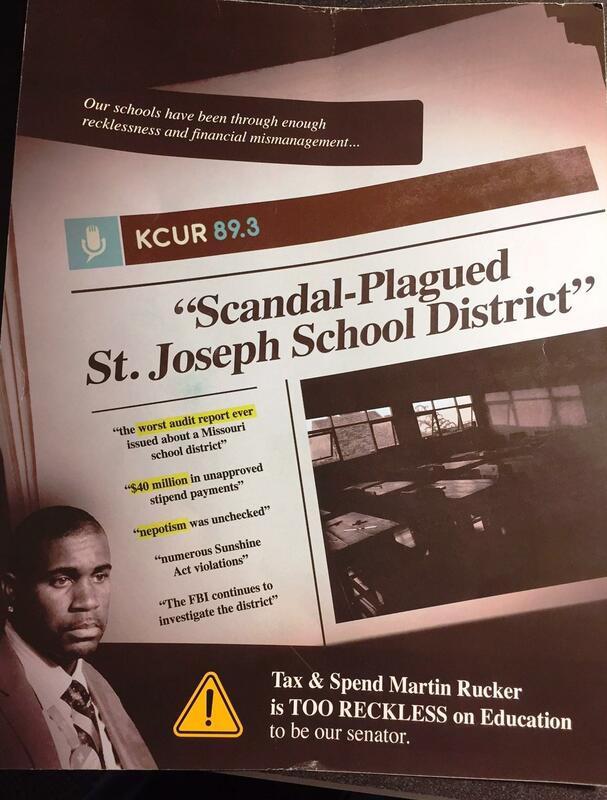 The mailer tries to tie Martin Rucker to the scandal in the St. Joseph school district, but it is the wrong Martin Rucker. The candidate's father served one term on the school board. "Deceptive, bizarre and dishonest," is how the younger Rucker reacted to the mailer that landed in mailboxes Monday. Rucker is running against Republican Tony Luetkemeyer, who won the nomination in a bruising and expensive primary against Harry Roberts. Luetkemeyer raised $451,000 for the primary and has about $230,000 on hand, according to Missouri Ethics Commission finance reports. Roberts raised $344,000. Rucker has about $120,000 on hand. When asked Tuesday morning if the campaign knew that Rucker was the son of the former school board member and had no association with the St. Joseph district, Luetkemeyer spokesman Sam Wright said, "That is my understanding." A few hours later a statement from Luetkemeyer simply said, "Voters should know Martin Rucker's record before they vote. He loves raising taxes on Missourians. I don't." Indeed, the mailer's reverse side calls him "Tax-raising Martin Rucker." "I have never held an office where I could raise someone's taxes," the younger Rucker told KCUR. The Missouri Republican Party, which paid for the mailer, did not immediately return an email seeking comment. The mailer came to KCUR's attention after a listener received it. She was puzzled when she saw Rucker's name. "I couldn't imagine what he had to do with the St. Joseph school board or that whole finance mess in St. Joseph a few years ago," Karla Schaffer of Parkville told KCUR.